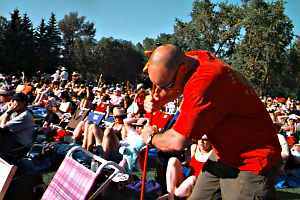 We continue with our series depicting tarp-markers at the Calgary Folk Music Festival. Regular Strange-Trippers will know that the term "series" usually (and mercifully) means a handful of days at most, until some other bauble catches the editorial eye. Though you certainly can't tell by our photographer's brilliant camera angle, the marker being so decisively planted here is indeed a glove; not a sequined glove, but an honest timber-framer's glove. At this juncture it was suspended by the index finger, though rumour has it that other digits were employed at times.